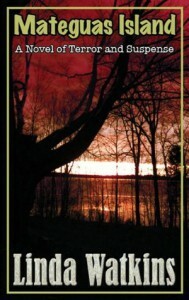 Mateguas Island, A Novel of Terror and Suspense - Linda Watkins - review - MATEGUAS TALK! On a remote island off the coast of Maine, a troubled family is trying to pick up the pieces of their shattered lives and start over. But unbeknownst to them, the property they have inherited is steeped in ancient magic – magic that could seek to consume and destroy them. An arcane locked box, a strange and foreboding trail into the woods, a seductive young woman, and tales of a malevolent Native American spirit, are just some of the perils Karen Andersen must face in order to find a way to save her family. GOLD MEDAL WINNER, 2014 Readers' Favorite International Book Award Competition, Category - Fiction, Supernatural! Winner of "Honorable Mention" in General Fiction, 2014 Halloween Book Festival! "Native American folklore blends with a tale of suspense and horror in the multifaceted Mateguas Island….Mateguas Island employs a device other authors (most notably Stephen King in his classic novel The Shining) have successfully used in placing danger both outside and within the family structure.... Surprising twists and turns and a powerful old box filled with magic: these are the elements of a fine horror story that slowly builds its plot with believable protagonists and engrossing color...Any who like horror stories and gothic fiction will find Mateguas Island an exceptional read." "...a fast-paced and unpredictable story that is both spooky and entertaining. Mateguas Island is an absorbing horror tale and is highly recommended."